ROBERTA Chapman has helped thousands of students take to the stage but for once, the spotlight is on her. The East Victoria Park resident’s work with the Catholic Performing Arts Festival has earned her a nomination in the arts and culture category in the 2016 WA Senior Awards. A life spent as a nurse, principal and teacher has been highlighted by the creation of the festival in 1989. 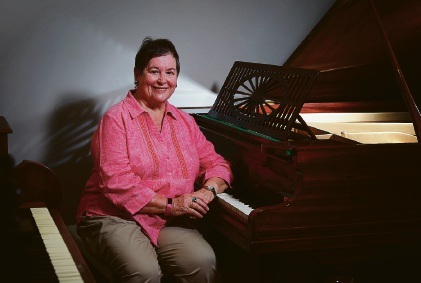 “I’ve always thought music was important and when I was teaching at St Paul’s Primary School at Mt Lawley I got involved in the group who were organising the festival,” she said. “The festival has grown in the past 27 years, more primary schools have got on board and there junior bands have performed. “I’m involved in the timetables and co-ordinating some of the sections, I’m still a committee member too. “The festival was set up properly when it was first run so there hasn’t been a need to change too much. Mrs Chapman said music had always been a part of her life and she had sung in a number of choirs. “I’ve sung in the Perth Oratorio Choir and the Collegium Symphonic Chorus, during which I was able to travel to Vienna, Salzburg and Budapest to sing,” she said. Mrs Chapman said the nomination came unexpectedly and she had no expectations about winning the award when it was announced on November 6 during WA Seniors Week. “I’m not sure who nominated me, I’m a bit mystified by it but I’m certainly happy,” she said.